Anyway, this is not the same model we reviewed about a decade ago, although it is closely connected to the (new, 21st-century) DT990 we rather liked a year or two back. 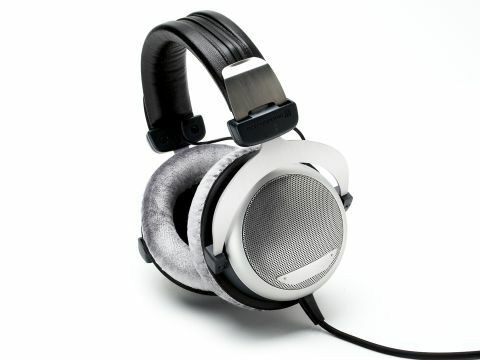 It features Beyerdynamic's exceptionally comfortable ear pads and a padded headband, with the latter providing an equal distribution of pressure on the head. The first impression when listening to the DT880 is that it somehow contrives to offer a very 'loudspeaker-like' balance and approach, which obviously will endear it to those listeners who don't want a full-on perspective shift every time they switch from one to the other. Background noise is not unduly emphasised or coloured, and dynamic variations in the music are neither overdone nor suppressed. As a result, it's easy to find the right listening level - something that's not always true with headphones. Detail is good until the very highest volumes when the sound does thicken up a bit. Still, that should help you avoid dangerous sound pressure levels. There is no marked preference for any musical style, though, if you like really bass-heavy stuff you may find the balance just a touch lean, and results via a CD player's output are quite similar to those from a headphone amp.